Alder Creek Restoration Project, UAS (OR) | WEST Consultants, Inc. 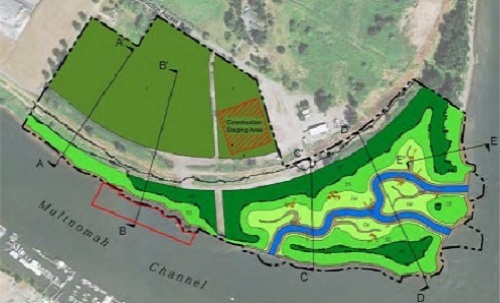 The Alder Creek Restoration Project was intended to restore hydraulic connectivity to an area of the former Willamette River floodplain at the southern tip of Sauvie Island, downstream of Portland, Oregon. Sauvie Island is formed between the mainstem of the lower Willamette River on the east of the island and the Multnomah Channel on the west of the island. Multnomah Channel splits from the Willamette River at river mile (RM) 3.1. This island and side-channel configuration is typical of the lower Columbia River estuary downstream of the Columbia River gorge. WEST Consultants was contracted as a sub-consultant to GeoEngineers, Inc. to conduct hydrologic and hydraulic analyses for FEMA No-Rise certification, to evaluate the impact of the project to onsite and offsite adjacent infrastructure, and to document the projected site hydrodynamic characteristics over the full range of flow conditions to support design calculations, site grading, and surface and subsurface treatments. In support of these objectives, WEST developed a 1-dimensional steady & unsteady flow HEC-RAS model to verify the no-rise condition and to test the low flow conditions through the restoration channels. This is a hydraulically complex reach of the Willamette River in that the flow patterns are influenced not only by rainfall runoff and regulated reservoir releases in the Willamette Basin, but also by high Columbia River flows and daily diurnal tide cycles. The HEC-RAS unsteady flow model was also used to assess habitat quality as well as sedimentation. To understand the flow patterns at high Willamette River flows, a 2-dimensional EFDC model was constructed of the site. This model was used to determine the effect the new geometry would have on the adjacent levee and an existing utility, as well as to assess the sedimentation and scour potential. In 2017, as a follow up to this project, WEST conducted a set of Unmanned Aircraft Systems (UAS) flights over the restoration site’s main channel. The imagery and video taken during the flights provided useful information on restoration progress and channel characteristics.